Time has changed Mandela's status from terrorist to saint (for many) and he will probably be regarded with the same reverence as Gandhi in future history books. Although Mandela was the first to admit that he was no saint, his humility and ability to forgive those who persecuted him meant that the divisions in his own country and in New Zealand were healed much faster than one would have expected. 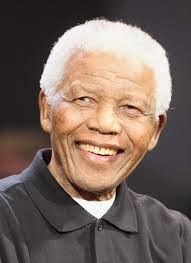 Now that he has died the leaders of the world are fulsome in their praise of Mandela as a man and the legacy he has left. The media is full of stories of those who had personal encounters with Mandela and even shook his hand and yet many of these same people had once regarded him as a terrorist. "Oh, I can't even remember ... 1981, I was 20 ... ah ... I don't really know. I didn't really have a strong feeling on it at the time. Look, it's such a long time ago." While I do think it is appropriate that our Prime Minister represents our country at the funeral I think it would be a gracious move on his part if he included representatives from the anti-apartheid movement to be part of the New Zealand delegation. Considering the physical violence and persecution that many leading anti-apartheid activists suffered during the protests (many are still the subject of abuse), it would be in the true spirit of Mandela himself if Key was able to do this. It would also be a wonderful symbol of how our own country has moved on from that divisive time. I'm pleased to see that you have taken a more conciliatory stance than Martyn Bradbury bsprout. This is not an occasion for partisan politicking. KS, Martyn is inclined to wear his heart on his keyboard fingers but I actually agree with much that he says on the issue. However I do recognise the position of Prime Minister and how his attendance at the funeral will give status to it. I would be concerned if John Key used the occasion to promote himself, as he is inclined to do at international events, and not recognise those who really made a stand in support of Mandela, when he himself did nothing at the time. Even if he doesn't recognise the main anti-apartheid activists, there are a number of Green MPs, like Kevin Hague who were on the frontline of the protests. I could be wrong but I don't think any National MPs made a stand in support of Mandela, but I am happy to be proven wrong. As I recall, Marilyn Waring MP, against orders from her leadership joined the demonstration in Hamilton where the game was cancelled. Though some privately opposed the tour Waring was the only National MP to break ranks, as she later did over the nuclear issue. It peeves me that Key "doesn't know" where he stood. Until he remembers, he's not ready to represent NZ at the funeral. AC, I would forgive him for his shallowness if he invited the right people to accompany him. Specifically relating to your last paragraph - it appears we have not moved on at all.